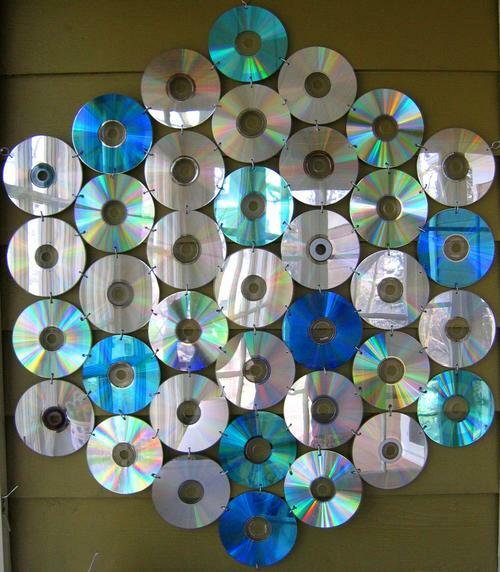 Thread: what to do with tons of CDs? My sister's husband gave me a suitcase full of CDs that he ranged out. Old discs from his office and AOL-commercial CDs, stuff like that. I guess there are about 400 discs. Don't know if that's been discussed before, but what can I do with those CDs? 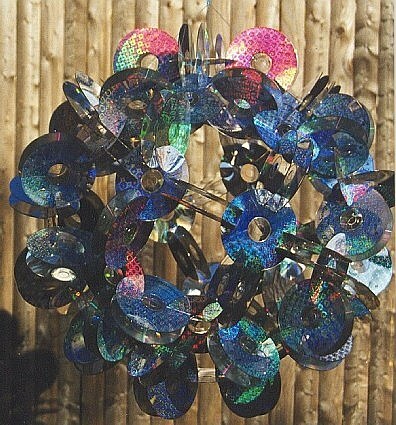 I once made a curtain out of some old CDs, which turned out to be a bad idea, because it's totally in they way in my room. But I really like the light effects they make when the sun shine's on them, and I'd love to do something out of all of the CDs! My sister hung up her's in her backyard, for one because the birds won't eat her strawberries anymore, and second, as I already mentioned, the lights CDs make are incredible! Do you have any other ideas to re-use old discs? I guess you could make a stepping stone, and either use them instead of tile which probably wouldn't work, or glue the CD's underneath onto the stepping stone, and then use clear glass tile and they will probably shine through. The only thing I've ever done with my old CD's is put them on my bulletin board for no reason. wow, I like that mobile-thing! You could cover a lampshade in a mosaic way! Thats all the ideas i have for it right now. Ill reply again if i can think of some more! I made a CD christmas tree for yard art one year. You start with 1 CD and add 2 to the bottom tieing with yarn. The next row has 3... I stopped at 7 and made a trunk thingie in the middle. I tied jingle bells on too. Very cute. This year I'm making CD clocks for Christmas gifts. I got stick on numbers and clock mechanisms. Voila. All that's needed is a hanger. Glue doesn't work well, will have to figure that one out. Man, you are so lucky! I almost never get the AOL boxes anymore. With AOL tins, boxes & CDs - you can cover them with ultra thick embossing powder & stamp in them or just paint with with enamel - then collage, decopage, etc. ooh, if they look nice in the light, maybe you could make a chandelier of some sort. like the mobile, but with lightbulbs or candles. or sconces, with one cd against the wall and another attached at a 90 degree angle to hold a taper candle? I'm not sure how she did it, but my friend made me this necklace. I think she cut up the cd and heated it and linked it together. I love it. Very JEM, she's truley outrageous!! Soory, I can't ever figure out how to get pics to go into forums.